The booster shut down and dropped away from the Electron’s second stage, heading for a plunge into the Pacific Ocean, as a single Rutherford engine fired to propel the upper part of the rocket and its seven payloads into a preliminary orbit. The Rutherford engine, developed in-house by Rocket Lab, fired more than six minutes to propel the rocket to the necessary speed to enter orbit. The engine uses pumps powered by batteries, an innovation for a liquid-fueled rocket engine, and all its primary components are 3D-printed, reducing the cost and time required during manufacturing. Rocket Lab confirmed in its live webcast of the flight that all six satellites separated as planned. First deployed from the Curie kick stage was the IRVINE01 CubeSat built by students in Southern California, followed by two ship-tracking and weather data collection craft for Spire Global, two pathfinder data relay satellites from Fleet Space Technologies, and the CICERO 10 commercial weather satellite built by Tyvak Nano-Satellite Systems for GeoOptics. Peter Beck, Rocket Lab’s founder and CEO, said the Electron rocket’s orbital accuracy was “exquisite” on Sunday’s mission, setting the stage for another Electron launch in December carrying around a dozen scientific and research CubeSats sponsored by NASA and developed at U.S. institutions and universities. The launch window for the next Electron flight is currently expected to open around Dec. 10 and extend to Dec. 18, according to two sources with payloads flying on the NASA-funded mission. 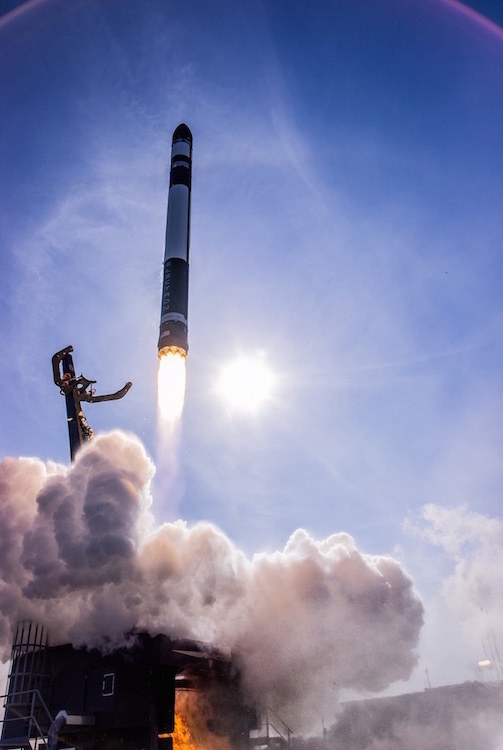 Sunday’s launch was the third flight of Rocket Lab’s Electron rocket, following a pair of test flights in May 2017 and in January the company named “It’s a Test” and “Still Testing.” Last year’s inaugural Electron mission fell short of orbit, but the Electron launch in January delivered several small spacecraft to orbit, including a geodesic sphere dubbed “Humanity Star” covered in reflective panels designed to make it visible from Earth. The Electron rocket is capable of placing up to 330 pounds (150 kilograms) of payload in a polar orbit around 310 miles (500 kilometers) above Earth. The rocket’s capacity to a lower-altitude orbit is up to 500 pounds (225 kilograms). Founded in New Zealand and headquartered in the United States, Rocket Lab says it can launch an Electron rocket for $5.7 million per flight, offering small satellite owners a more affordable, dedicated ride to orbit than larger, more expensive rockets, which often launch large clusters of smallsats at a time. Rocket Lab planned to launch the “It’s Business Time” mission in April, but engineers discovered a problem with a motor controller during a fueling test. The controller woes continued during a launch attempt in June, and Rocket Lab stood down from the launch campaign to resolve the issue. The Electron rocket finally launched Sunday on the first attempt after the months-long delay. Two the satellites launched on the Electron rocket Sunday are owned by Spire Global, a San Francisco-based company which builds and operates a fleet of CubeSats collecting weather data and tracking maritime traffic. The Lemur-2 satellites are about the size of a shoebox, and also carry instrumentation to track aircraft in flight. 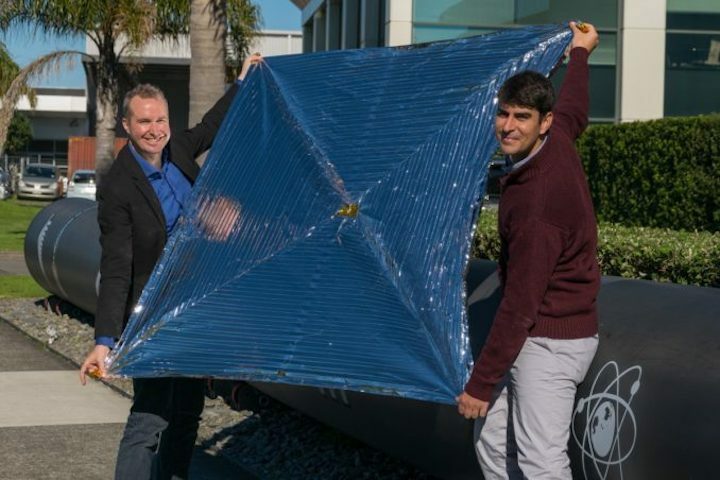 Another California-based company, GeoOptics, also launched a small satellite for its own commercial weather monitoring constellation, which monitors GPS navigation signals passed through the atmosphere to measure temperature and moisture profiles. The GeoOptics CICERO 10 spacecraft was the biggest of the bunch launched Sunday, weighing in at around 22 pounds (10 kilograms). A CubeSat named IRVINE01 built by Southern California high school students also lifted off on the Electron rocket. 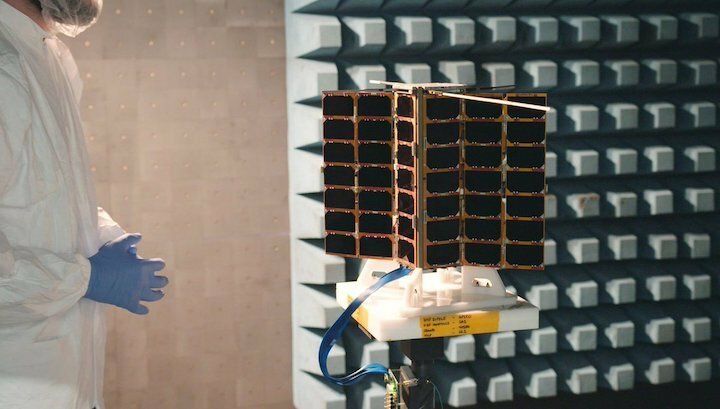 Fleet Space Technologies, an Australian company with plans to build a network of tiny tracking and data relay satellites designed to connect with devices in remote locations on Earth, also launched its first two test CubeSats on Sunday’s mission — named Proxima 1 and 2. A German-built payload from High Performance Space Structure Systems also rode into orbit Sunday to test an aerodynamic drag sail that could be used to de-orbit future satellites and help clear space junk out of orbit. The drag sail was to remain attached to the Curie kick stage and unfurl after the separation of the other satellites. In an interview with Spaceflight Now last month, Beck said Rocket Lab has laid the groundwork for a more fast-paced launch manifest, despite the delays in launching the Electron rocket this year. Rocket Lab opened a new high-volume factory in Auckland last month. Coupled with a factory in Huntington Beach, California, Rocket Lab can produce up to one new launch vehicle every week, Beck said. The company also broke ground on its first U.S. launch pad at Wallops Island, Virginia, in October. There are up to 16 Electron launches planned in 2019, Beck said, between the New Zealand launch site and the new pad in Virginia, which is scheduled to begin supporting missions in the third quarter of 2019. Beck said Rocket Lab is generating “significant revenues” from customers, and the company’s backlog is growing. But the company has its sights set on more launch sites, including a potential location in Scotland and possibly a second U.S. launch base. That could require more financing. Rocket Lab’s investors to date include Khosla Ventures, Bessemer Venture Partners, DCVC (Data Collective), Lockheed Martin, Promus Ventures and K1W1. The government of New Zealand also approved an innovation grant to Rocket Lab during Electron’s development.